The application of psychiatry to war and terrorism is highly topical and a source of intense media interest. Shell Shock to PTSD explores the central issues involved in maintaining the mental health of the armed forces and treating those who succumb to the intense stress of combat. 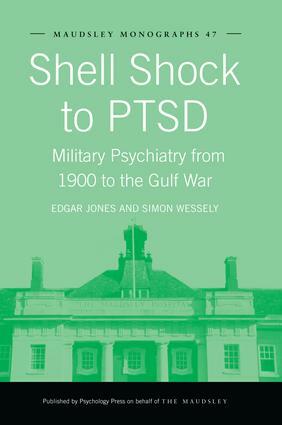 Drawing on historical records, recent findings and interviews with veterans and psychiatrists, Edgar Jones and Simon Wessely present a comprehensive analysis of the evolution of military psychiatry. The psychological disorders suffered by servicemen and women from 1900 to the present are discussed and related to contemporary medical priorities and health concerns. This book provides a thought-provoking evaluation of the history and practice of military psychiatry, and places its findings in the context of advancing medical knowledge and the developing technology of warfare. It will be of interest to practicing military psychiatrists and those studying psychiatry, military history, war studies or medical history.